For this head-to-head review article, we will be comparing the Calphalon vs Cooks Standard Stainless Steel Dutch Ovens. This article will go in-depth with an explanation of each Dutch oven’s main features, pros, and cons. Furthermore, we will also choose a winner for each sub-category of features each Dutch oven will possess. On top of that, we’ll discuss which product has the best price, durability, versatility, and much more. Finally, we will choose an overall winner for best stainless steel Dutch oven. This will hopefully aid in your journey in finding your next great Dutch oven. With that said, let’s start with some key reasons to choose stainless steel cookware. Why Choose Stainless Steel Cookware? Stainless steel cookware has many benefits over other cooking material types. And besides being beautiful to look at, these Dutch ovens feature the same quality and durability that stainless steel fry pans, bread pans, and stock pots have been offering for years. So, what are the benefits? First of all, stainless steel is one of only a few cooking material types that is induction cooktop ready. This factor alone makes stainless steel cookware worth the price, Furthermore, induction cookware heats up fast and stays hot longer for added convenience. Second, unlike non-enameled cast iron cookware, stainless steel can be placed in a dishwasher. This not only makes clean-up a breeze, but it also saves you time in the kitchen during parties and Holiday get-togethers. Finally, stainless steel cookware will last longer than most non-stick aluminum cookware. This also means that wear from scratches and gouges will be less of an issue as well. Furthermore, when combined with the versatility of a Dutch oven, no wonder these Dutch ovens are top sellers. So with that said, let’s move on to the Calphalon 5-quart Tri-Ply Stainless Steel Dutch Oven and its features. The Calphalon 5-quart Tri-Ply Stainless Steel Dutch Oven is feature packed and a real heavy-hitter. This Dutch oven offers up a sizable 5-Quart capacity at a fantastic price. Furthermore, you’ll skip all of the toxic chemicals found in Teflon type cookware. Furthermore, you’ll own a top-quality, low maintenance piece of cookware that will easily last for decades. Finally, the Cooks Standard 7-Quart Stainless Steel Dutch Oven comes with a great manufacturer’s warranty to put your mind at ease. What more could you ask for? So, be sure to check out our full review of the Calphalon 5-quart Tri-Ply Stainless Steel Dutch Oven.With that said, let’s now take a look at the Cooks Standard 7-Quart Stainless Steel Dutch Oven and all it has to offer. The Cooks Standard Stainless Steel Dutch Oven offers many compelling reasons to purchase. One of those reasons is its superb build quality. Not only is this Dutch oven built from 2 layers of stainless steel, but it also has an aluminum disc placed in the center of the cooking surface. This feature prevents hot spots and keeps the heat evenly distributed. Not only that, it also retains heat better than all steel or aluminum cookware. This is thanks to the layered benefits aluminum and stainless steel offer when combined. Second, this Dutch oven’s ability to handle 500-degree temperatures makes it quite versatile. You’ll be able to sear, bake, broil, and fry with ease. However, it should be noted that the tempered glass lid can only handle temps up to 350 degrees. Remember to visit our full review of the Cooks Standard Stainless Steel Dutch Oven, as well as links to where to purchase. Which Stainless Steel Dutch Oven Is More Durable? When considering a new Dutch oven, how well it’s built is one of the most important factors. How well it holds up to everyday wear and tear can and often is a deal breaker. So, which stainless steel Dutch oven is most durable? The Cooks Standard 7-Quart Stainless Steel Dutch Oven edges out the Calphalon 5-quart Tri-Ply Stainless Steel Dutch Oven in this contest. And with its thicker and more durable construction, is it any wonder? This also means that the Cooks Standard 7-Quart Stainless Steel Dutch Oven will resist wearing spots much more efficiently than its competition. Plus, with its 18/10 steel construction, you can be sure the Cooks Standard 7-Quart Stainless Steel Dutch Oven will last for decades. Which Stainless Steel Dutch Oven Is More Versatile? While both of these stainless steel Dutch ovens are incredibly versatile, the Cooks Standard 7-Quart Stainless Steel Dutch Oven wins once again. And it all comes down to cooking capacity and how many people it can feed. And while the Calphalon Stainless Steel Dutch Oven has a 5-Quart capacity, the Cooks Standard Dutch oven offers up a generous 7-Quart capacity. This makes meal preparation for large groups of hungry guests a breeze. Both of these stainless steel Dutch ovens offer up a great deal of versatility. However, when all is said and done, Cooks Standard offers up better value and more versatility as well as a better cooking capacity which in this case makes all the difference. Which Stainless Steel Dutch Oven Is Easier To Clean And Maintain? When choosing a Dutch oven it’s extremely important to find a model that is easy to clean and maintain. Luckily, stainless steel cookware is incredibly easy to clean and maintain. After all, it is stainless steel. First off, remove any large leftover food particles from your pan. Next, use hot soapy water with a nylon scrubber to get rid of the excess food particles. Then, simply rinse and let air dry. You can even place these stainless steel Dutch ovens in the dishwasher for added convenience. With that said, which Dutch oven comes out on top? Tie…..They’re both extremely easy to maintain and clean. Both the Calphalon and Cooks Standard stainless steel Dutch ovens offer simple and intuitive cleaning and maintenance. You really can’t go wrong with either piece of cookware. Furthermore, both Dutch ovens offer great stain, wear, and scratch resistance. So, whichever stainless steel Dutch oven you choose you can be sure you won’t be in the kitchen all day cleaning cookware. And best of all, they’re dishwasher safe, so you’ll definitely save time and effort. 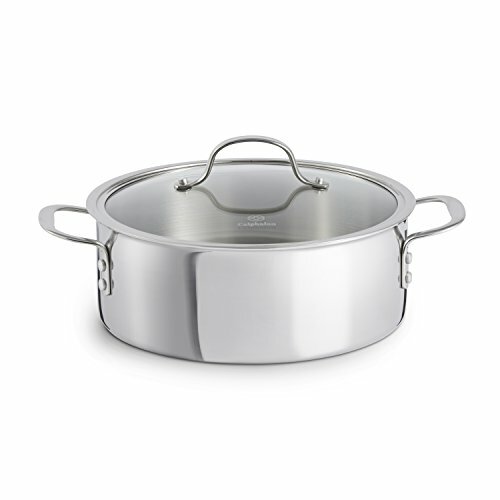 And if you are interested in the Calphalon 5-quart Tri-Ply Stainless Steel Dutch Oven, Click Here and link to where to purchase as well. As you can see, both Calphalon and Cooks standard each offer up great stainless steel dutch ovens. They are versatile, easy to clean, durable, and best of all, affordable. With that said, however, there can only be one overall winner. While purchasing either Dutch oven would be a smart move, we feel that the offering by Cooks standard is slightly superior in a few categories. First of all, is the matter of the larger cooking capacity cooks Standard offers. And at 7-Quarts, the Cooks Standard 7-Quart Stainless Steel Dutch Oven definitely delivers. This is in contrast to the Calphalon 5-quart Tri-Ply Stainless Steel Dutch Oven. This Dutch oven possesses a cooking capacity of 5-Quarts. Which is quite good as well, however, it does come in second to Cooks Standard’s offering. The second factor that allows Cooks Standard to come out on top is the thicker material used to construct it. 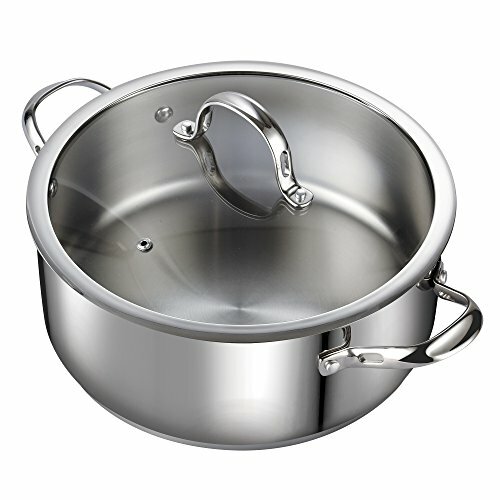 The Cooks Standard 7-Quart Stainless Steel Dutch Oven offers up 18/10 stainless steel for its body. This not only allows for better heat retention but also makes the Dutch oven resist warping from excess heat and usage. Better yet, it will also handle drops better making it harder to bend and damage. This is why we feel the Cooks Standard 7-Quart Stainless Steel Dutch Oven comes out on top. You definitely can’t go wrong with either one of these stainless steel Dutch ovens. And at such affordable prices, you may even want to get both. However, if you have to choose just one, then the Cooks Standard 7-Quart Stainless Steel Dutch Oven is your best bet. And for our full review of the Cooks Standard 7-Quart Stainless Steel Dutch Oven, you may Click Here. Furthermore, if you would like to visit our full review article on the Calphalon 5-quart Tri-Ply Stainless Steel Dutch Oven, then please Click Here. Well, there you have it. We would like to truly thank you for taking the time out of your busy day to view our article on Calphalon vs Cooks Standard Stainless Steel Dutch Ovens. We hope you have luck in finding your next stainless steel Dutch oven. Thank you again, and as always, please take care.